Collaboration is key in today’s healthcare settings, and the inaugural Interprofessional Education Week at the University of Indianapolis will highlight the benefits of this approach for students, faculty, medical professionals and patients alike. Taking place Oct. 1-5, 2018, with many events open to the public, Interprofessional Education (IPE) Week is the brainchild of organizers from the College of Health Sciences, the School of Nursing and the College of Applied Behavioral Sciences. Students will have the opportunity to participate in classroom and extracurricular activities to learn about trending topics in various healthcare fields. While many interdisciplinary events are hosted each academic year, this marks the first time that organizers are bringing them together in a single week. “Interprofessional practice and education are critical components of working in healthcare. It’s very rare that we as healthcare professionals work in a silo, where we don’t interact with anyone else,” said Alison Nichols, assistant professor of occupational therapy and IPE Week organizer. IPE Week features a kick-off event Oct. 1, and panel discussions on topics including addiction, health disparities and ethics, which are all open to the public. Dr. Brenda Howard, an assistant professor of occupational therapy who serves on the Ethics Commission for the American Occupational Therapy Association, will speak about the importance of ethics and how that affects everyone, regardless of their profession. Other events are aimed specifically at students in healthcare-related fields, including a home assessment, an emergency simulation and the Diabetes Escape Room. Briyana Morrell, assistant professor of nursing and IPE Week organizer, said the goal is to encourage students to consider how they will address various patient needs alongside colleagues in other professions. Nichols provided the example of an inpatient rehabilitation floor of a hospital, where a patient might come into contact with a physician, nurses, occupational and physical therapists, a social worker, pharmacists, speech language pathologists, and more. She said everyone on the patient’s team needs to work together – and IPE Week helps students recognize the benefits of collaboration. “All of us engage in ethical behavior and decision-making; we all need to recognize the roles that each member of the team can play; we all need to be able to communicate effectively; and we all have to be able to collaborate in order to give the patient the best client-centered care possible,” Nichols explained. The interprofessional perspective pays dividends for faculty as well as student success. 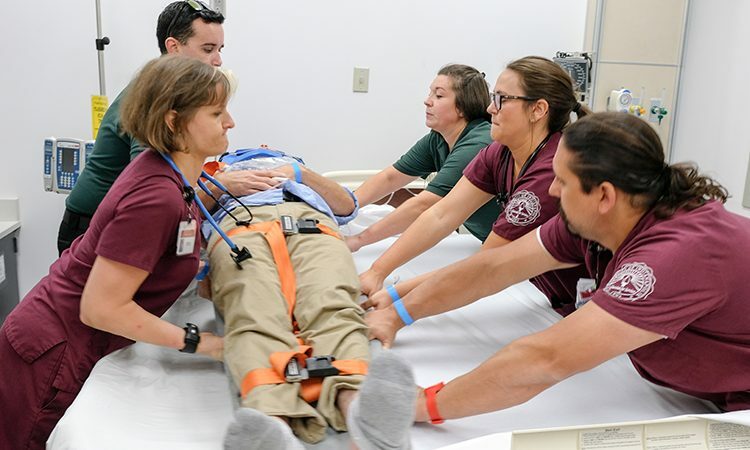 Emergency simulations held in 2016 and 2017 have served as the basis for several scholarly pursuits for UIndy faculty, and dozens of faculty have presented posters or talks on IPE at regional, national and international conferences. “Many of the faculty who are organizing this event also have an article in press, another under review, and a final one near submission. What’s more, these events have helped faculty learn about each others’ professions, programs, students, and work,” Morrell said. Morrell encouraged the entire campus community to be part of the inaugural IPE Week. “Even if you think you know a lot about healthcare, you may find you don’t know as much as you think and have room to learn and grow. It will benefit you, your profession, other students, and your patients,” she said. The Interprofessional Education Week planning committee would like to thank the following sponsors: Lambda Epsilon Chapter of Sigma Theta Tau International Nursing Honor Society, the University of Indianapolis Center for Aging & Community, the Central Indiana Oncology Nursing Society and Community Health Network. Additional thanks to Zoll for cardiac resuscitative equipment. Diane Healey Geriatrician Lecture R.B. Annis Theatre, Health Pavilion 4 p.m. Public. L/P credit available. Ask ProEdge: Resume and Career Coaching Health Pavilion atrium 9-11 a.m. Emergency simulation Health Pavilion 8-11 a.m.
Next Post:Commencement update from Stephen Kolison, Jr.